The winged knights-magically altered humans-are the only ones defending the portal from Av'lor to Earth. With defeat imminent, they find an unlikely source of hope in software engineer, Kathryn. Kathryn doubts her life could get any worse after the death of her mother and daughter. She realizes her mistake after she arrives on Av'lor with only part of her house and hungry creatures looking for their next meal. Once the knights bring her under their protection, she discovers their angry commander is far from welcoming. Sir Lanclor, Commander of the Knighthood, lives with the curse of betrayal. While the treachery occurred lifetimes before, few see past his guarded shell to the grim man beneath. Barely holding the Knighthood together, his grip tightens when Kathryn joins their ranks. Her stubbornness and surprising strength not only energizes the knights, but also makes Sir Lanclor question his self-imposed isolation. With the approach of an invading army, Kathryn and Sir Lanclor must find a way to end centuries of war and save two worlds. Kathryn did not think her day could get any worse. She had already called the police to come and assist her, but then all of a sudden they were pulled through a portal to another world. Now with a confused policeman to talk to and an entire new and potentially dangerous world to navigate, Kathryn's got to get herself together! Sam's writing style was unique. It offered some description, but more like watercolors in a painting instead of explicitly detailed lines, colors, and images. You get some sense of a description, a bit of character development, but overall I did feel as though I was missing something and wished there could be a bit more "oomph" to the writing. I really enjoyed the premise. While the world of Av'lor is pretty reminiscinet of midieval earth, it's apparently set in relatively modern times in a world that is parallel to ours. Makes for an interesting time and place no? 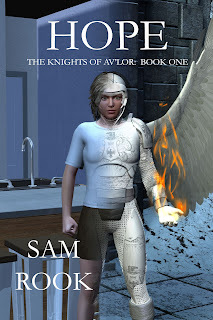 The pace of the story moves quickly and while there is a lot going on in terms of battles, plotting, and even a little romance spiced in there, I definitely enjoyed that Sam was attempting to add so many elements into one story. Now, monsters and creatures are always my favorite part of a fantasy or sci-fi series...Hope introduces us to a huge range of these types of beings, from winged demons to knights (also winged). The knights are where the sci-fi comes in...because apparently they are genetically modified humans? Right! If I were to be experimented on that's one modification I'd be okay with! The overall themes and interaction between characters, monsters, and the plot were great! I would definitely keep reading this series! Sam will be awarding a $10 Amazon or Barnes and Noble GC to a randomly drawn winner via rafflecopter during the tour. Lisa, good luck with the giveaway! "... she strives to give her readers a chance to enjoy worlds that transport them away from the stress of everyday life...." And that is EXACTLY why I read so many books! Thank you! You're welcome, Laney and Rita! Thanks for taking the time to check it out. I really enjoyed the excerpt and I like the premise as well. Thank you. It is a new author for me but I would love to learn more! Thank you for the reveal!